Both during the academic year and during the summer, Reed offers a range of academic internships both at Reed and beyond. Some, like the Corbett and Goldhammer grant programs, support collaborative research projects between Reed faculty and Reed students. Others, like the McGill Lawrence Internship awards, complement academic studies with a summer internship in the public or nonprofit sector. A winter externship program takes place in January each year, providing students with the opportunity to get an in-depth look at a specific career during the break between semesters. 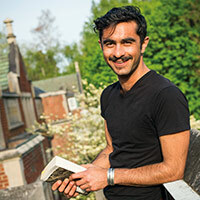 In his junior year at Reed, history major Alexi Horowitz won Reed’s McGill Lawrence Internship Award. The award helps students take volunteer (unpaid) summer positions by providing up to $4,000 for eight weeks of full-time work. Alexi, who grew up in New Mexico, had always been fascinated by the converging and sometimes competing cultures of his home state; his senior thesis is focused on Santa Fe’s complex archeological history. Alexi’s academic interest in history expanded through the internship. “In [New Mexico], it’s easy to entrench ourselves in an inherited perspective—you see claims of precedence, and you see violence and injustice. The only way to build something constructive is to bring the stories together and allow them to co-inform one another without drowning each other out.” It is a process, he says, that reminds him of the Reed classroom. Many fellowship and award opportunities require the applicant to have the support and endorsement of their undergraduate institution in order to apply. The Fulbright, the Beinecke, and the Watson are a few examples. Reed’s Faculty Committee on Fellowships and Awards coordinates student applications for awards that require college nomination, endorsement, or review. In addition, help and advice are available from the faculty, the dean of the faculty, and staff members at the Center for Life Beyond Reed for awards that do not need the committee’s support, such as the Gates Cambridge Scholarship, the Humanity in Action award, and the Andrew W. Mellon Fellowship in Humanistic Studies. Inaugurated by President John R. Kroger, with generous support from trustee Dan Greenberg ’62 and his wife, Susan Steinhauser, the President’s Summer Fellowship awards stipends to students to carry out summer projects that combine intellectual pursuit, imagination, adventure, personal transformation, and service to the greater good. 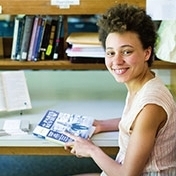 Jo Stewart, an English major who had spent a semester in Paris studying French literature and modern dance—won the President’s Summer Fellowship with a proposal to intern at a major publication, learn as much as she could, and then produce a peer-reviewed journal featuring the voices of Reed students. With the fellowship, she secured a position as the summer poetry intern for the Paris Review, a quarterly literary magazine that had just moved into new offices in Harlem. She studied back issues to get a sense of Poetry Editor Robyn Creswell’s taste—while the Paris Review solicits most of its content, Jo’s job was to go through the slush pile—boxes of unsolicited manuscripts—and pass along anything that had promise. Indeed, Lorin Stein, the magazine’s editor in chief, told Jo, “I can tell you’re a Reedie.” After returning to Reed, Jo produced her first literary journal, the Reed Symposium Series, featuring the work of students and alumni. Students find service and volunteer opportunities in Portland through Reed’s SEEDS program, which can connect them with community efforts to protect the environment, address hunger and homelessness, support and strengthen workers’ rights, and tutor elementary school students. Congratulations to our Early Action and Regular Decision admitted students! Submit your enrollment deposit by May 1, 2019 to confirm your place in the class of 2023. What is a Reedie? We've asked proud members of each graduating class since 2009 to tell us about themselves and their Reed experiences.